← Are dogs our prisoners – or slaves even? Colours – Why can my dog retrieve a blue ball better than a red ball? Roger Abrantes states here that researchers at the University of California in Santa Barbara confirmed that dogs see color, though not as well differentiated as humans do. Abrantes says that studies performed by Russian scientists demonstrated that dogs tend to discriminate real color rather than brightness cues. Very interesting then that Kong makes their toys mostly red! Why not blue? Is it because it’s the humans with money in our pockets and we are more likely to choose red? I have changed over to blue balls with my own dogs and they can find them more easily than the other balls I have that are orange. I have found wonderful lightweight and near-indestructable blue balls that are a funny shape so may bounce off in an unexpected direction – sold by Battersea Dogs Home. Here is the story of a dog I went to who is so focussed on the ball at times that the rest of the world almost ceases to exist. Too much ball play isn’t advised. Certain dogs can become obsessed on the ball and too much chasing can over-stimulate others. 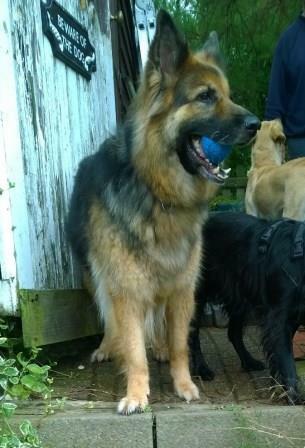 This entry was posted in PAWS for Thought, Science & Health and tagged balls, blue ball, colours dogs see, dog eyesight. Bookmark the permalink.